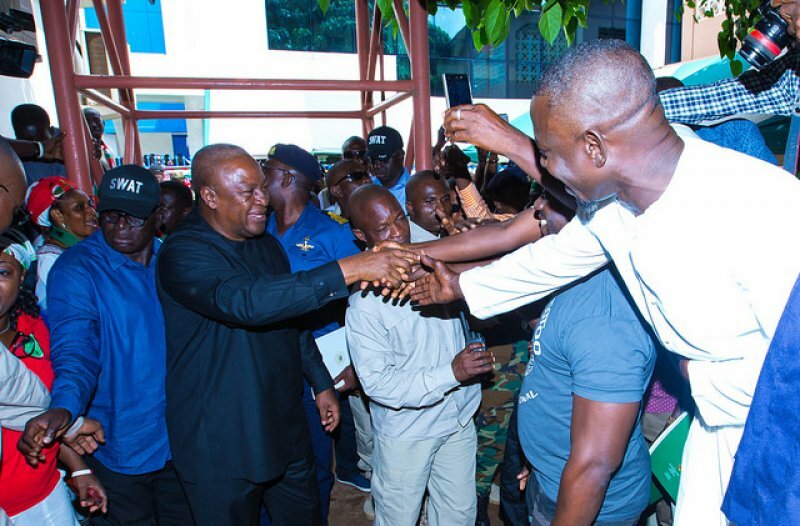 President John Mahama has resumed his accounting to the people tour of the Greater Accra Region with a promise to build a hospital, a Senior High School and a market for the people of Madina. The president had to cut short his tour following the sudden demise of his mother last week but resumed, Tuesday after the mother was buried according to Muslim traditions on Friday. The president was welcomed by tens of spirited supporters of the party at the Madina market car park. President Mahama told the supporters that Madina is so dear to him because he spent most of his adult life in the area and is aware of the challenges the people face. Myjoyonline’s Abubakar Ibrahim who was present at the tour reported the president as saying the Madina Polyclinic expansion project will soon be completed as stated in his state of the nation address. The president however added that a new, bigger hospital is being built at Atomic to cater for the health needs of the growing population. He added that the Madina roads will be asphalted in the coming weeks and a new market will be built under a Private Public Partnership agreement as was done in Ho, Cape Coast and Kumasi. To cater for the education needs of the residents, the president said a new Senior High School will be built for the residents at Danfa. The president had early on paid a visit to the chief at Madina Zongo who demanded a completion of the hospital at the Kekeli park. The Regional Minister Nii Afotey Agbo who embarked on the tour with the president donated some provisions, bags of rice and sugar to the Zongo chief before later addressing the gathering. Speaking in Ga, Mr Agbo asked for the support and prayers for the government going into the elections. He said Ghana needs peace so they should remember the nation and the party as the Muslims are fasting. Madina is a suburb of Accra and in the La-Nkwantanang-Madina Municipal Assembly, a district in the Greater Accra Region of southeastern Ghana. Madina is next to the University of Ghana and houses the Institute of Local Government.